Are you gathering evidence to make your case? If you or someone you know has recently gotten hurt at work, don’t wait. You may be able to collect damages for your injuries in a slip and trip fall settlement, thereby removing the financial burden of rehabilitation and medical care from your shoulders. A “slip and fall case” simply refers to when a person slips or falls on a hazardous surface. In personal injury law and premises liability law, this is a common type of case. TMH Law in Philadelphia is experienced fighting for worker’s rights, including those which are compromised in an injury situation at work. 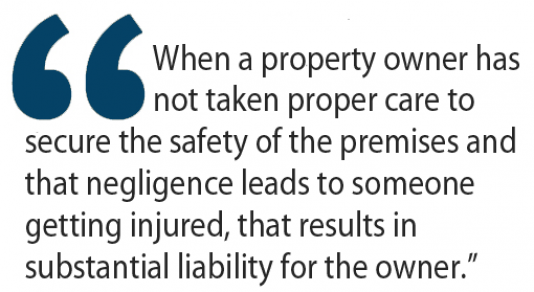 When a property owner has not taken proper care to secure the safety of the premises and that negligence leads to someone getting injured, that results in substantial liability for the owner. Read more to avoid common mistakes when seeking a settlement for a work-related injury. Did you know that slips and falls is the top reason for claims for workers compensation and a leading cause of occupational injury in workers aged 55 and older? Slippery surfaces caused by muddy, wet, icy patches. This could materialize outside of a business entrance, or right on the floors inside where shoes and umbrellas cause water puddles. Even if the owner doesn’t control the weather, he or she still has a responsibility to clean these surfaces or put a sign up to warn about the dangerous condition. Food and liquid spills are also a cause of falls at a business. An owner has a duty to monitor these spills and ensure that the business does everything it can to clean it up in a timely manner. Cracked pavement, tile, and chipped or rough flooring with holes or loose carpets may also be a cause of an accident in which the property owner is liable. Have you ever tripped over a piece of loose carpeting or loose wood flooring? The key is: if you’ve been injured, don’t waste any time. The longer you take, the harder it can become to gather the evidence needed to prove your case and win a slip trip and fall settlement. Call a personal injury lawyer today at TMH Law to have your case assessed in a free consultation with one of our attorneys.